Lot of times when you are reading an email you get some thoughts like "oh I need to confirm dates", or "John's phone # is 650 350 1122" or "Need to include that PPT" etc that you want to remember. But there is no easy way to capture that thought. This Zimlet solves that problem by allowing you to make quick notes and attach them to that email. Once you attach a Sticky Notes, it will automatically pop-up that notes next time you re-open that email. 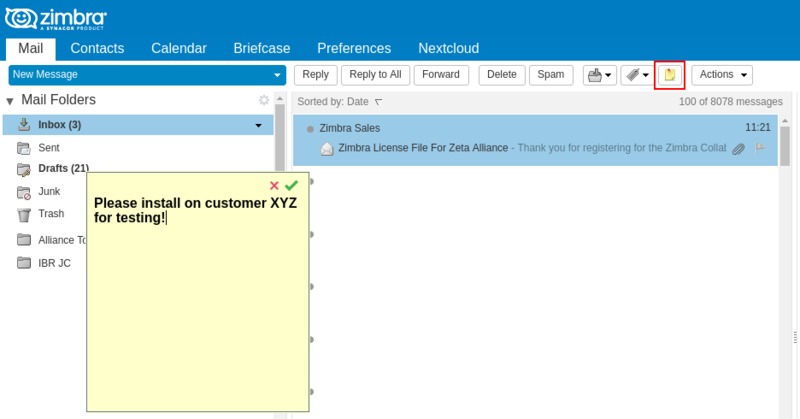 Click on the StickyNotes button or drag-and-drop a message onto the Zimlet to apply a stick note. After enabling the Zimlet, a yellow-colored tag called "Emails with StickyNotes" is created. When a user attaches a stickyNote to a message, the Zimlet tags that email or conversation with this tag. The tag is removed when the stickyNote is deleted. Users can search and keep track of all stickyNote emails by clicking on the tag or by searching for it in the main search bar. Beim Initialisieren des Zimlets „com_zimbra_stickynotes“ ist ein Fehler aufgetreten. Bitte informieren Sie den Administrator. I noticed and reported today some error message with ZCS 8.7.1. It was fixed within hours and it's already working fine the same day. There's also a version compatible with Zimbra 8.0 available.